While I'm still catching up, I see that the M's drafted Rich Poythress at #51. Even if they didn't pick BPA at 27 and 33, the guys they got there have some useful talent, and if they're able to sign Poythress, this draft is a HUGE win for me. Huge! Seriously, while we're likely going to regret not taking a shot at one of the pitchers that were available at 27 and 33, I still am mostly happy about this draft. When building my opinion on players for the draft, I place a lot more value in scouting reports than in statistics. There are so many factors that influence statistics such that you can't really tell by the statistics what type of baseball player a draftee may become. Yeah, you can see some trends and some things in the numbers, but they're almost as meaningless as spring training statistics. Having said that, you can't ignore statistics all together. Obviously a guy who slugs .700 has some pop in his bat. Aluminum bats or not, that can't be ignored. When the M's swept Oakland to end the season, they lost the shot at having the first overall pick in today's draft. That pretty much meant they're the bridesmaid in the Stephen Strasburg sweepstakes. While it is sort of a bummer, I'm going to focus on the positives. Heh. In general, pitchers are riskier than hitters. High school pitchers are riskier than college pitchers. That seems to be common knowledge. So, in that regard, I would be fine with the M's being the bridesmaid in this draft when Dustin Ackley is the "consolation prize." He's a lefty bat, with tremendous speed, decent power, good outfield instincts, and he should be a safe bet to be a decent player in the majors. I'm not going to name "comps" because that's just ridiculous, IMHO, but should his arm heal up enough to regain strength to throw from CF again, he will be a very good value. Interestingly, and somewhat unsurprisingly, Dave Cameron throws the idea up on FanGraphs that "there's a not-too-ridiculous case to be made that the Nationals should draft Dustin Ackley instead [of Strasburg]." I've been thinking that for quite some time (and not just because of wishful thinking that Washintgon passes on Strasburg). Tanner Scheppers is a guy that's been talked a lot about, too. While there's legitmate concerns about his shoulder stuff (as there was with Morrow), his "stuff" is second only to Strasburg's (according to the reports I've read). There's a lot of risk with pitchers in general, so it'll be interesting to see what happens to him, even if the M's don't draft him. Guys I've been following a bit are Rich Poythress, Matt Purke and Tyler Matzek. The latter two are prep pitchers -- left handers -- with excellent stuff. Poythress is a righty lumbering first baseman for Georgia. If any of those three fell to the M's at 27, I'd be excited. I doubt any of them will, however, even with outrageous bonus demands. Guys I'm not very high on in this draft (where others are) include Grant Green and Brett Jackson. Green's got some legitimate concerns w/r/t fielding position, and Brett Jackson has questions about his bat. They're still both good enough to be considered first rounders in this current draft, however. One thing's for certain -- about the only thing the M's DON'T need is a relief pitcher. Yeah, they have some depth at several positions, but I'm pretty confident that if they choose a particular player it won't solely be because they're drafting a guy to fill a need. Since Day One, Zduriencik has said it's all about filling this team with as much talent as it can get. Ryan Divish reports this morning that the M's aren't really concerned about bonus demands -- they're more focused on getting the "best player available:"
And according to McNamara, the Mariners are committed to getting the best players. Things like outrageous signing bonuses and difficult agents aren’t issues. “Not an issue,” he said. “We’re lining them up and taking the best guys. We keep it to talent. I'll believe that when I see it. Clearly the budget-conscious Howard Lincoln has given Zduriencik and McNamara a dollar figure. And that dollar figure is probably lower than what M's fans and draft followers think it should be. If, however, Washington takes Cameron's advice and picks Ackley over Strasburg, then I'm willing to bet that dollar figure is increased just a little bit. I'm with Zdurienck, Mac! Just get it right! I've been very disappointed with the M's choices in the most recent draft. Save for Aumont, they've pretty much gone in the direction I didn't want them to go in. This year, there are several options, and knowing that the M's aren't going to blow huge bucks on the draft (in spite of what Divish reports this morning), so long as they don't draft one of the guys I don't like ahead of one I do, I probably won't go too ballistic. There's talent to be had, for sure, and the only way I'm disappointed is if the M's go waaaaay cheap and pass up on highly-rated players for easy-sign overdrafts. After catching an inning of the Rainiers on TV, I decided to flip over to Felix and the M's. I watched most of the game, flipping back-and-forth to the R's game (Yikes, Hyphen! YAAAAY ADAM!!!). The end of the M's game, however, really shocked me. Rob Johnson amazed me yet again with a reasonably decent defensive performance. My issue with Rob has been with his ability to block low pitches and just his overall catching the ball behind the plate. I've always thought his arm was pretty good, but I never understood why, beyond his arm, he was considered a good catcher. But that's a discussion for another day. I was surprised that Wlad was still in the game in the bottom of the 9th and in the 10th. The M's strength this year has been pitching and defense. If you don't want to pinch hit for Wlad in the 9th, fine, but you gotta get your glove guy out there. People should know that I've been an advocate of Wlad's defense for awhile, but even I recognize that Endy Chavez is waaaay better out there. In the top of the 10th, Wlad did his best Raul Ibanez impression and baaadly misplayed a ball, leading to a lead-off double. A walk to Morneau, and then Kubel comes up and jacks one darn near over the fence. Except that Mark Lowe owes Franklin Gutierrez a nice dinner - Gutz comes back with the ball and throws it to 2nd, keeping Morneau from advancing, while Mauer advanced to 3rd. Then we come to a very rare play that you don't see all the time -- a pitch-out on a suicide squeeze call, leading to the runner at 3rd being tagged out. It was a brilliant move, whoever called it. The Twins' batter at the plate tried his darndest to get some wood on the ball, but it was too far out and they were able to nail Mauer before he scored. Between the robbed HR, and the brilliant pitch-out, the M's had some major momentum. I love Wlad, I really do. But that was some poor play and some poor decision-making out of Wak, too. After years of waiting, I finally got to see Adam Moore in person tonight. Obviously Marc got a head start, and has posted some fantastic pictures here of both him and Michael Saunders -- the two guys I focused a lot of attention on with my cameras tonight. As per usual, I didn't stay for the whole game, so I missed the epic comeback in the 8th. I haven't sifted through all the photos yet, and Jason gets first dibs (I've already sent him several). But I wanted to post just one photo from the game tonight -- actually I shot this just before the game during warmups. 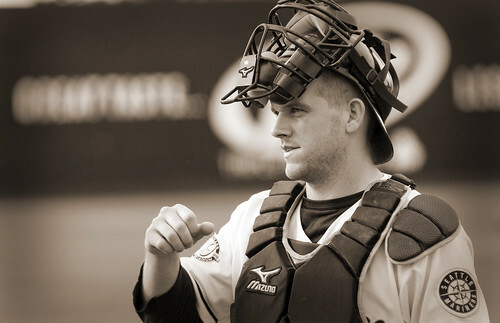 Here's Adam in his catcher's gear just before taking his spot behind home plate. While I wasn't über-impressed with his bat tonight (from what I saw anyway), I do have a photo of him keeping the ball in front of him and blocking the ball very well. Since the guys didn't take BP (they landed in Seattle at around 2 p.m., or so I was told), I'm not surprised their bats were a little rusty.